When driving your car, nothing is much more nerve-racking than your check engine light coming on. Like most people, you probably have no clue what could possibly be wrong. The check engine light is just one of the many mysterious lights that flash on your dashboard. There are many different things that your check engine light can mean. Of course, it doesn’t mean that you automatically need to pull over on the side of the road and abandon your car. It does mean, though, that you probably want to schedule an appointment at the car shop to have them check over your vehicle. 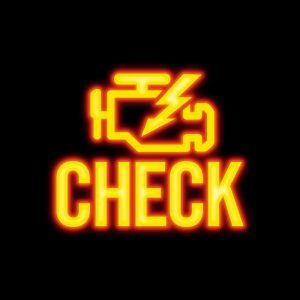 Below are some of the most common reasons your check engine light comes on. Missing, damaged, or loose gas cap: your gas Helps to keep the pressure in your fuel tank and seals off the fuel system. It also contains the gasoline fumes and keeps them from being emitted into the atmosphere when you are not driving. Need to replace your O2 sensor: the O2 sensor measures how much oxygen is unburned in the exhaust system on your vehicle. When the O2 sensor fails, your vehicle may still operate as normal but will likely not pass an emissions test. Need to replace your mass airflow sensor: this sensor measures how much air is entering into your engine to determine the amount of fuel you need to effectively run the engine. When your mass airflow sensor needs replacing, you may feel a reduced power in your engine. Need to replace the catalytic converter: the catalytic converter produces carbon dioxide from carbon monoxide to protect the environment. When it is damaged, it will cause your vehicle to stall and lead to complete engine failure. Exhaust gas recirculation is insufficient: the EGR recirculates some of the exhaust from your engine back into the engine’s cylinders. If it isn’t working correctly or is clogged, your engine will not perform the way it should. Need to Replace plug wires are spark plugs: the spark plugs are used to ignite the mixture of fuel and air. Your engine will ultimately fail if you neglect to replace your spark plugs. Any of the above problems can cause your check engine light come on. One of the best ways to determine what the problem is is by going to your local car shop. This entry was posted in Maintenance and tagged Check Engine on April 25, 2017 by Erica Nguyen.